YuppFlix is an opportunity for one to watch movies online legally. This online streaming service has more than 5000 movies and 12 international languages. YuppFlix was launched last December with lots of excitement among movie enthusiasts. You can watch movies across different genres like comedies, thrillers, action movies, romantic movies and dramas. The content is definitely there as YuppFlix offers up to date entertainment with over 25000 hours of on-demand content accessible to people with a subscription and an internet connection. YuppFlix caters to the Indian Diaspora also streaming movies in Tamil, Hindi, Bengali, Punjabi and Kannada. It delivers high quality digital content which appeals to a wide range of audiences. For a long time, Indian expats have found it difficult to access legal movie over the top Indian content. This streaming service ensures that it provides instant movie updates through ad campaigns and by pushing notifications. Indian entertainment fans all over the world can enjoy their favorite movies from whenever they are at the click of a button. Some of the films popular on the YuppFlix movie package are Size Zero, Tripura, Pasanga 2Haiku and Baahubali. Thrillers include Fattoo Saala, Dr. Saleem and Aavi Kumar. This Valentine’s Day YuppFlix resonates with the spirit of romance by streaming popular romantic movies. 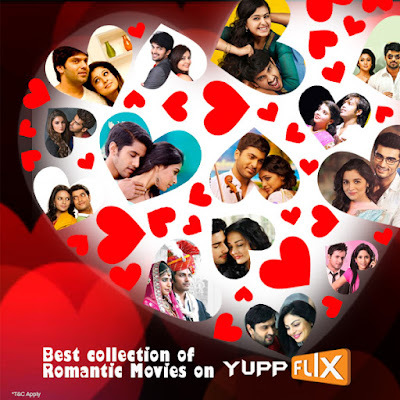 Some of those romantic movies one can enjoy this Sunday are Vaalu, Oka Laila Kosam, 2 States, Mega and Anegan. These movies can also be watched by the Indian Diaspora in a diversity of languages to communicate the language of love on that day. So this Sunday, one can enjoy their day with their lover watching movies on this platform. To get access to YuppFlix, one should subscribe so that they get access to their favorite films. One needs just an internet connection from where they are. It can be streamed on smart Blu-ray players, connected TVs, computers, laptops and mobile devices.